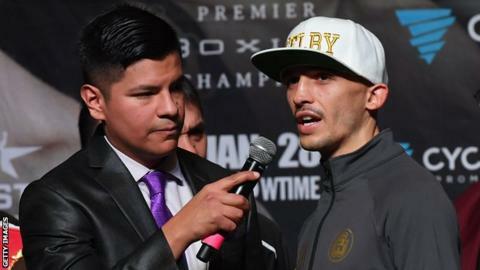 Wales' IBF featherweight world champion Lee Selby will fight Andoni Gago in a non-title bout on 4 March. The 30-year-old was due to defend his title against Jonathan Barros in Las Vegas in January but the fight was called off at 24 hours notice. Argentinean Barros was not able to meet the medical requirements of the Nevada State Athletic Commission. Selby will now face Spaniard Gago at London's O2 Arena, on the undercard of David Haye's fight with Tony Bellew. "I know the main event isn't going to last too long so I wanted to make sure there was a nice juicy few fights on the undercard," said Haye. "After his [Selby's] fight fell through, I really felt for him boiling his massive frame down to nine stone and not getting any work that night." An IBF statement said Selby will remain champion for the non-title fight. "While the situation with Barros gets clarified the IBF has agreed to allow Selby to fight a non-title bout above the weight limit," the federation said. Selby is looking to keep his schedule in line with Northern Ireland's Carl Frampton. The duo could meet this summer, especially with doubts surfacing over Frampton's trilogy contest with Leo Santa Cruz.